Fayth has been grooming and caring for animals for 10 years. 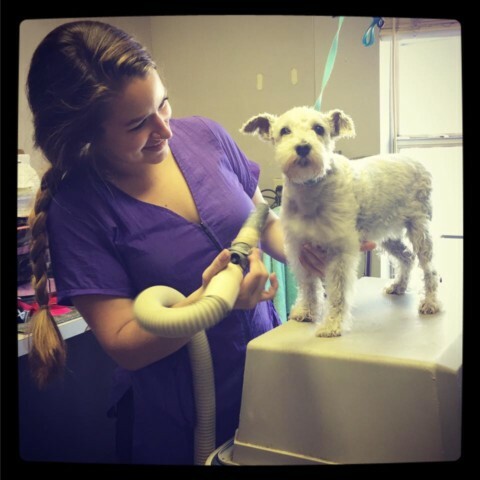 She has groomed dogs and cats of all breeds, shapes, and sizes, and her grooming experience also includes sheep! Though she has only been here for a short time, she has a large list of regular clients that faithfully bring their pets to her every month. Feel free to contact the clinic for references, or head over to our staff page to learn more. Follow us on Facebook for photos of patients including those that have taken advantage of Fayth’s skilled grooming services. You don’t have to be a client here to have your pet groomed by Fayth. We simply ask that you provide documentation showing that your pet is current on vaccinations.